Senator from North Carolina. He has served less than one year in the Senate. What policy areas does Sen. Tillis focus on, as expressed by his press releases? Learn more. What topics does Sen. Tillis talk about in his recent press releases more often than other members of Congress do? Learn more. What members of Congress use language that is most similar to Sen. Tillis in their recent press releases? Learn more. S.1171, a bill sponsored by Sen. Tillis, was read twice and referred to the Committee on Banking, Housing, and Urban Affairs. S.1171: A bill to suspend the current compensation packages for all officers of Fannie Mae and Freddie Mac. 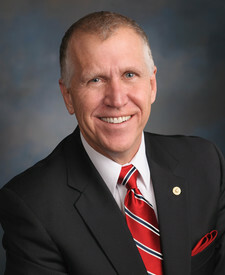 S.1125, a bill sponsored by Sen. Tillis, was read twice and referred to the Committee on Health, Education, Labor, and Pensions. S.1125: A bill to amend the Health Insurance Portability and Accountability Act.